A churchyard full of howling werewolves is the setting for Tales of Darkness: Full Moon. Created by Novomatic, it’s a typically simple but volatile 5 reel, 40 payline video slot. The main bonus round offers up to 20 free spins complete with a second wild symbol. Play on the PC, tablet or mobile from between 40p and £100 per spin. The design here isn’t quite as good as some of Novomatic’s recent releases but it’s still a step up from some of the very tired looking video slots in the developer’s back catalogue. With a cemetery shrouded in mist in the background, you’ll see lower vale Gothic style A to 10 symbols dominating the reels. They’re joined by a black cat, a wise old owl and a werewolf. The dandy werewolf hunter is the most lucrative standard symbol, offering awards of up to 25 times your bet per payline. Appearing on the middle 3 reels only is the wolf’s eyes symbol which is the wild. It replaces everything bar the full moon scatter. If you’re lucky enough to find 3, 4 or 5 scatters on the same spin, you’ll receive a payout of 2, 6 or 20 times your total bet. You can also look forward to 10, 15 or 20 free spins in the Free Games feature. Joining the action during the feature is a second wild symbol. This can also hit on reels 2, 3 and 4 only. If you land 3 or 4 scatters on the triggering spin, you’ll get a respin with the scatters locked in position – this is known as the Full Moon Bonus feature. This gives you a shot at landing a higher number of free spins. It’s a case of if it ain’t broke, don’t fix it with Tales of Darkness: Full Moon which sticks to Novomatic’s tried and trusted formula. It’s no thing of beauty but the design is solid enough. The straightforward gameplay isn’t very flashy either but it still packs a pretty hefty punch. The variance here is in the medium to high range with maximum wins of 1,000 times your bet on every spin/free spin. 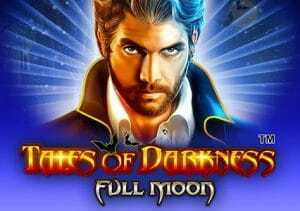 If you’re a Novomatic fan, Tales of Darkness: Full Moon ticks all the right boxes. For simple, volatile gameplay with a horror theme, you won’t go too far wrong here. I also recommend you play Yggdrasil Gaming’s Wolf Hunters which has a similar theme but it more volatile and can be more rewarding.